A visit to the local farmers markets always gets the creative juices flowing. This summer and fall season I’m lucky enough to have a new farmer’s market just steps from my door and I intend to take full advantage of what they have to offer. Heirloom tomatoes, fresh snap green beans, golden and purple beets, gourmet popsicles and pizza, fresh loaves of bread, honey, cheese and so much more. I found these lovely Pattypan squash for the second time in two years and I wanted to make a simple recipe to highlight and respect the local ingredients. 1. Over medium-high heat let butter and extra virgin olive oil get to the temperature of the pan and melt. 2. 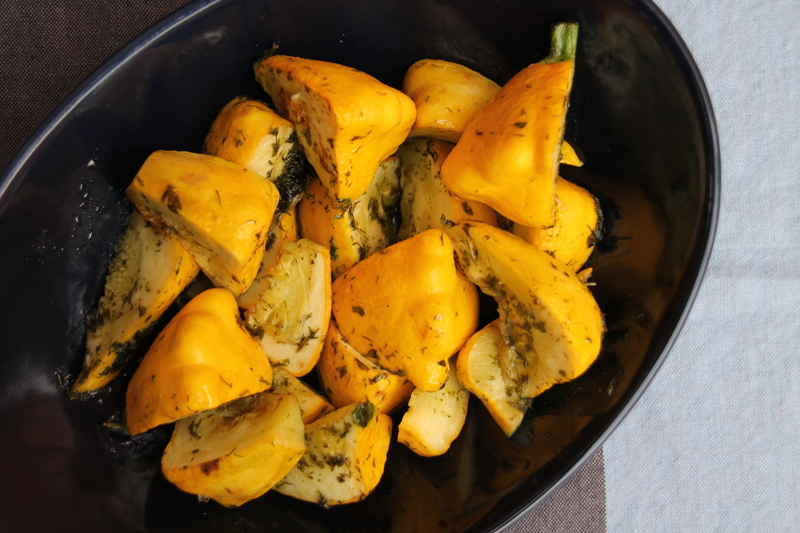 Add pattypan squash along with fresh herbs. 3. Cook for 5 min, ensuring squash stays crunchy. I enjoyed pattypan squash for the first time last month when I visited the CN Tower 360 revolving restaurant. I hadn’t managed to buy the squash I saw last year, so I was very happy to come across it again this year. Simple summer sides are a delight to make especially with the farmers markets finest produce. The squash was buttery and herby and the aroma was delightful. I love a good crunchy vegetable and this was the perfect side to my dinner last night. I have had a very long break from my Alphabet Cuisine series and the letter “L” is the reason why. I found a few recipes with Lamb and Lentils but they were just okay and I wanted the series to consist of new and interesting recipes and ingredients I don’t cook with a bunch. I have been working hard to get lentils to work and I finally found a recipe that it out of the park delicious. 1. Using a small saucepan, with the lentils in the pot bring the water up to a boil then let simmer for 5 to 7 minutes. Lentils. 2. In a medium saucepan pour quinoa into the pot and bring to a boil then let simmer for 15 to 20 minutes. 3. In the meantime, prep all the vegetables, herbs, and place in a large bowl and set aside. 4. In a small bowl whisk the dressing ingredients together until emulsified. 5. Drain off the water from the lentils and quinoa once cooked and then pour into the bowl with the herbs & vegetables and incorporate. 6. Add in the dressing and mix well. 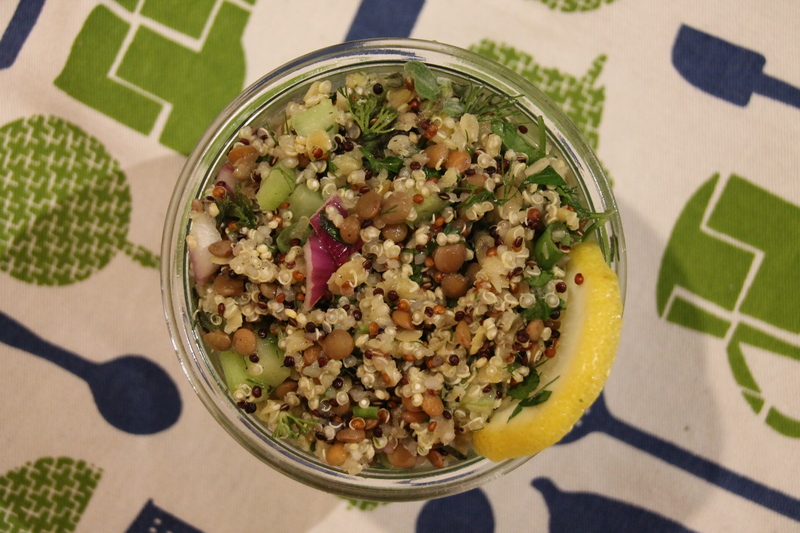 I have another recipe with quinoa and lentils in it that I can say I am thoroughly enjoying. I think the catch with lentil or quinoa is these two ingredients really can’t stand alone and require flavourful and many other ingredients to help the appeal of them. Or that is the case for myself as I can’t enjoy lentils and quinoa alone in . The fresh herbs and vegetables added texture and interest to the recipe and the simple and satisfying dressing just enhanced everything in this salad. I can now eat lentils more often and actually enjoy it. I also managed to turn a friend who can never seem to get through their lentil or qunioa dinner or lunch sides into a lover and I’ve already been asked for the recipe. It’s no mystery by me having this blog that I absolutely love to cook and some days I can be in the kitchen for hours on end on my feet. To past the time I bring in my IPad to watch some TV shows and while watching a few shows the commercial breaks were filled with ads for LG presents Chuck Hughes with little snippets of recipes. Well since Chuck’s in my top two favourite chefs of all time it was obvious I was going to try some dishes from these mini ads and since the timing was right Valentine’s Day would be a great day to make this simple and succulent dinner. Cook Time: 1 hour & 30 min. 1. Pre heat oven to 425°F. 2. Rinse chicken on cool water and pat dry inside and out. 3. Finely chop the herbs and mix into softened butter and add lemon zest in a small bowl. 4. Rub herbed butter under the skin and on top of the chicken and inside. 5. Sprinkle with salt and black pepper. 6. Fill chicken cavity with lemon, garlic and onion. 7. Tie the legs with kitchen twine. 8. Place sliced onion in the centre of a cast iron skillet. 9. Rest chicken on top of onions breast side on top of the onions. 10. Roast for 30 minutes at 425°F and then reduce heat to 350°F and continue to cook for 1 hour. 11. Baste chicken every 15 minutes to brown the skin. 1. Soften the onions from the cast iron skillet skimming off any fat. 2. Place skillet on the stove over medium-high heat and using a wooden spoon scrape the flavour from the bottom on the skillet. 3. Stir in the flour to make a roux. 4. Slowly add in the chicken broth letting the flour dissolve. 5. Add wine if desired. 6. Cook for 3 – 4 minutes and season with salt & pepper if desired. 1. Boil potatoes in a large pot until tender and drain. 2. Crush potatoes with a wooden spoon just enough. Leave some potato pieces chunky. 3. Stir in the olive oil and the remaining ingredients. 1. Pre heat oven to 400°F. 2. Coat baking sheet with non-stick spray. 3. On a plate combine all of the herbs, spices and cheese. 4. Coat zucchini with olive oil and then coat in mixture. 5. Bake for about 10 minutes and serve. This couldn’t have turned out any better; well if I had finely chopped my herbs. My idea of finely chop versus the recipe was different and I recognized that upon its completion but it didn’t deter from the recipe in any way. It was just a visual thing for me. The chicken was moist and scrumptious and perfectly coloured and for the first time I had a gravy from scratch that actually tasted and turned out excellent; even with my omission of the white wine. The review was great as I tested this out in advance and at work when I was eating it for lunch I got many compliments on the smell and a co-worker was trying to track down where that smell was coming from; which made me chuckle. The addition of dill to the mashed potatoes and the zucchini was a delicious. I decided to not serve the zucchini with the Spicy Aioli recommended though and I was already in the kitchen for a long time at this point. I can’t wait to make this again. This recipe is so simple you could make it the first time on a special day and not worry about something going awry. This recipe has been on my “to-do list” for a year now, and I was only recently reminded by a fellow blogger Maiu at Toronto Cooks that I need to finally make a coq au vin. We both are a part of a couple cooking clubs and this is how I stumbled upon and now follow her blog. This classic French dish is chicken braised in a red wine sauce giving the chicken a purple “wine” stained colour. 1. On high heat boil at pot of salted water and fill with the baby potatoes and sweet potato. (Cook until they are firm as they will be cooked more later on). 2. In a large frying pan, on medium-high heat, fry the bacon. 3. Pour all the herbs and spices into a pessel and mortor and grind. 4. Rub Dijon mustard over chicken and pour half of the herbs and spices over the chicken and rub in. 5. In the frying pan with the bacon fat add the onions, celery, carrots, garlic and mushrooms and brown, about 5 minutes stirring frequently. 6. Remove from pan set aside in a bowl. 8. Using the same frying pan place in the chicken along with the olive oil and sear and brown, about 5 minutes on each side. 9. Using the large pot on medium-high heat pour in the chicken stock, red wine, butter and whisk in the flour. 10. Finally place chicken on the bottom of the large pot and place the potatoes and sweet potatoes over top and then all the vegetables and bacon. 11. Add the remaining spices on top. 12. Stir occasionally, but try not to disrupt the chicken below. •	Make sure baby potatoes and sweet potatoes are cut to the same size to ensure they cook at the same rate. •	If your bacon is salty, adjust the salt content accordingly. 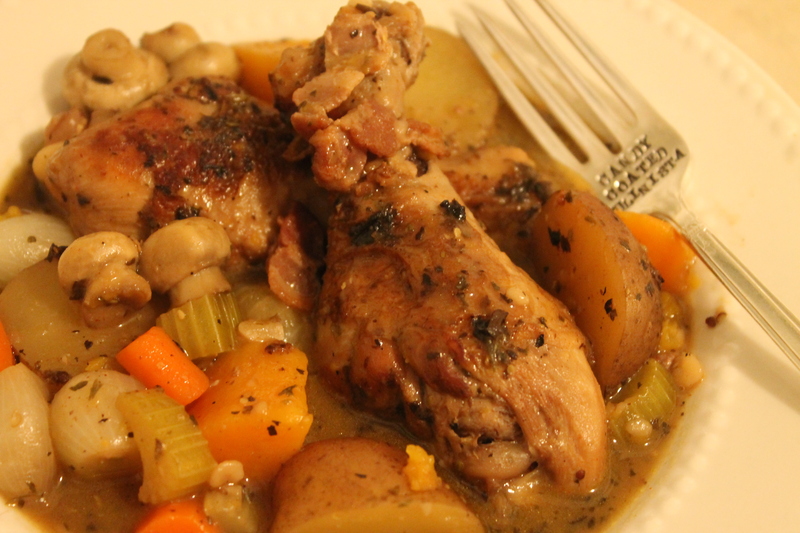 Coq au vin seems to be peasant’s dish to me with its simple and humble ingredients. I had a theory when I thought of placing the chicken at the bottom in my assembly. 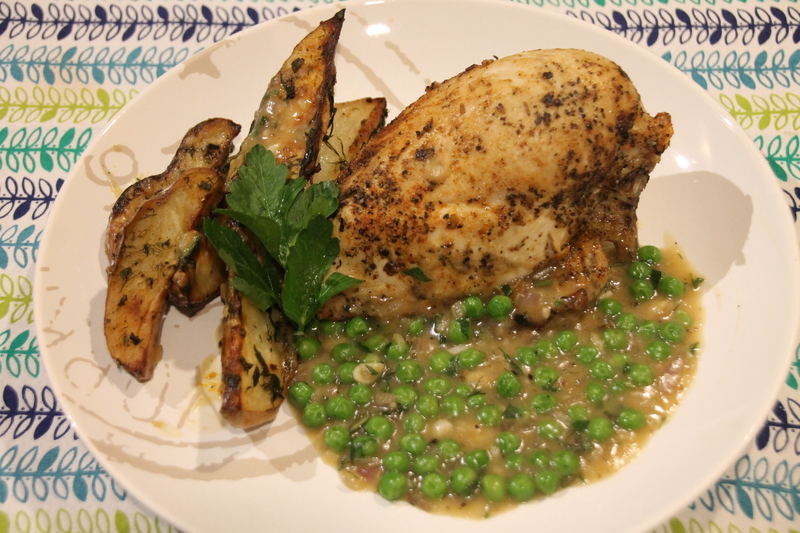 The chicken was only partially cooked so they needed to be closest to the heat, then the potatoes as they were a little hard and finally the veggies as they were pretty much cooked. 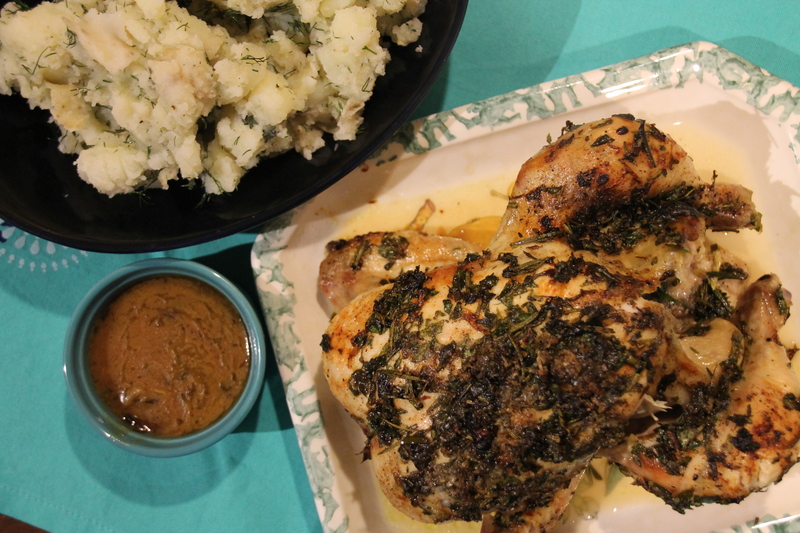 The potatoes stayed firm, the veggies were crunchy and the chicken was great. I wish I could get the chicken to be more wine stained, but that would entail me marinating it for 4 hours or more. As I made this on a whim thanks to Maiu, I didn’t really have any for-thought to making this and i still think it turned out and looked scrumptious. After my Mediterranean Inspired Dinner I had a lot of dill left over and as I am not one to waste, I immediately said “dill butter”. 1. Chop and mince dill, garlic and parsley and pour into a bowl along with the margarine. 2. Season with salt and pepper. 3. Mix until well combined. •	Don’t over salt whatever you are putting the dill butter on. •	Use unsalted butter to control how much salt you want in the butter if any. •	Scoop out portions and freeze to use at a later date. Wrap in some wax paper and cover with cling film and place in a freezer bag. 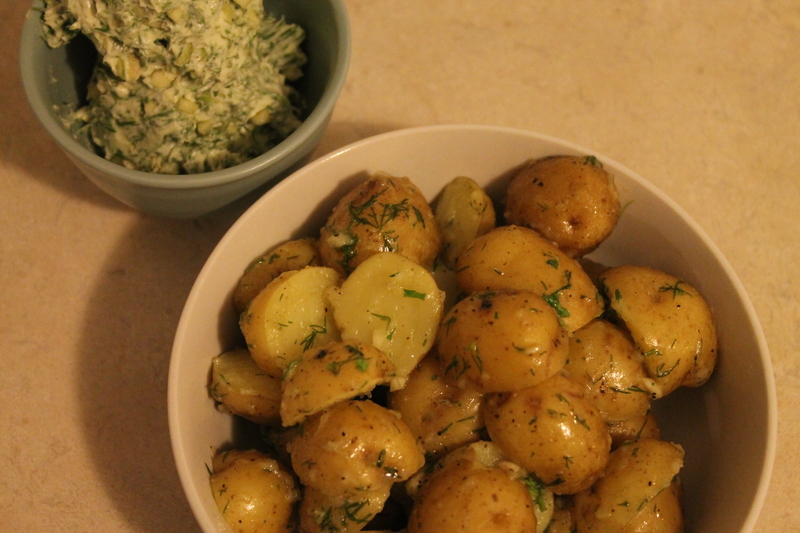 I made these to accompaniment my baby potatoes and this tasted amazing. I could still taste the fresh dill and the aromatics of the garlic and dill. I also bought some mini ciabatta breads and prepared dill garlic bread for snacks and to accompany pasta dinners.